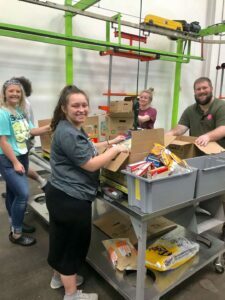 SMWC students (from left) Taylor Weber, Paige Passmore, Jessica Moore, and Greg Pateras, associate director of campus life, sorting food at the Houston Food Bank during the Alternative Spring Break trip in Houston, Texas last month. 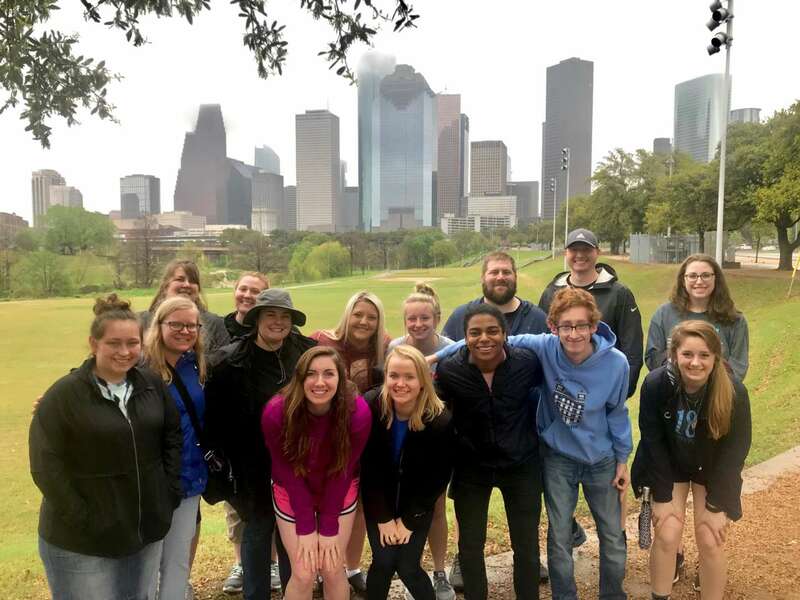 College students have a variety of choices on how to spend their spring break but 11 Saint Mary-of-the-Woods College students and four staff members chose to spend the week volunteering in Houston, Texas. With a diversity of service experiences available, the participants came back to campus positively changed by cultural immersion and service projects with local organizations. They spent time with children in section eight housing developments, with dementia and Alzheimer’s patients at a day community center, with people living with HIV/AIDs, with women at a homeless shelter and with homeless on the streets. The group also sorted and packed food at the Houston Food Bank, the largest in the country. For Olivia Wells, a junior business administration and marketing major from Marshall, Illinois, the Alternative Spring Break trip on March 10 to 15 turned out to be a great learning experience particularly due to one eye-opening activity: Urban Plunge Downtown Houston. This activity gave the students a glimpse of a typical day for someone experiencing homelessness in Houston, and the obstacles one could run into while trying to get around the city. Not one to shy away from a conversation with strangers, Wells said she led her group in approaching three people in the streets to ask about their lives. “I learned not to judge a book by its cover,” she said of the experience. Talking to them about how they became homeless and everyday issues— from the importance of having an ID to their relationships with other people in the streets— made her realize that the homeless are just like us; they just don’t have a home, she said. She was struck by how “real” and open they were to talking about their situation. Seeing that the struggles are real made Wells grateful for the opportunities she has and taught her not to take things for granted. 15 SMWC students and staff spent a week at Houston, Texas in March as part of Alternative Spring Break trip. From front left, Emma Taylor, Kayla Moats, Michael Natt, Alexander Trindle-Brown, Olivia Wendel, Paige Passmore, Alyssa Henson, Allison Mauk, Taylor Weber, Jessica Moore, Greg Pateras (associate director of campus life), Josh Winters (campus minister), Olivia Wells, Lisa Behringer (student development), and Kalista Lawrence (campus counselor). While this trip was Wells’ first time to go on one of SMWC’s annual Alternative Spring Break trips, this was Allison Mauk’s third time. Mauk, a junior from Terre Haute, said she may have done different service activities in each city during each trip but she saw the same needs. 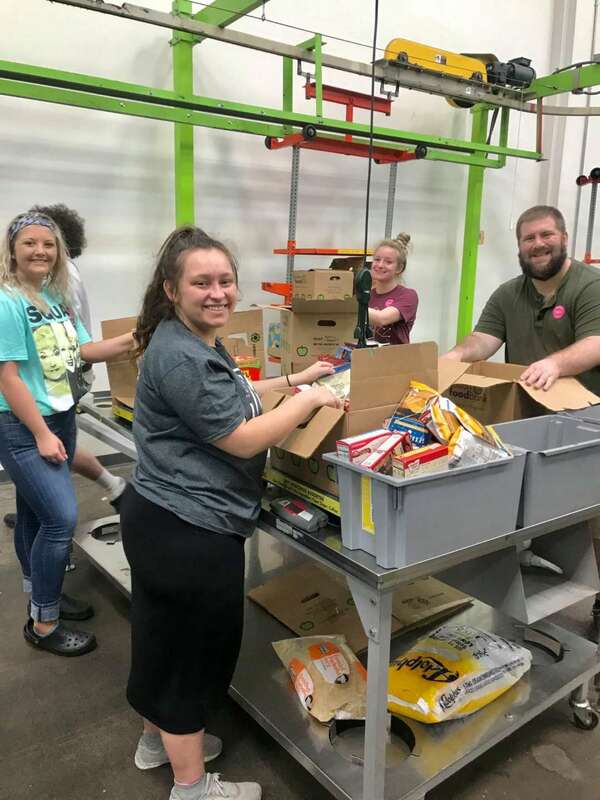 From this recent trip, Mauk said she gained a lot from the service activity at a women’s homeless shelter and recovery program. The program provides food, shelter, training and educational activities to help women get back on their feet and move forward in life. Mauk said she is passionate about women’s issues so, she appreciates learning about this type of program in Texas. But what of her main takeaway from the trip? “There’s still so much work that needs to be done. There’s so many different … people who need help and even though we have government programs and we have service opportunities, there’s so much that we ourselves could be doing, too,” she said. As a human services major, Mauk said she gained a new understanding and appreciation for helping the homeless through the trip. SMWC Campus Minister Josh Winters, the trip’s organizer, said the Alternative Spring Break week focused on the problem of homelessness, which is one of the biggest problems in Houston. Aside from service, the students also had the chance to explore Hispanic culture at a farmer’s market and to drive through inner-city neighborhoods during a prayer tour. Alternative Spring Break is an important part of the SMWC experience because it gives students a chance to learn about themselves and their world, Winters said. It allows learning to occur beyond the classroom. “[These] trips are a great way to expose students to different cultures and experiences while living out the mission of SMWC: ‘effecting positive change in a spirit of service,’ Winters said, quoting part of SMWC’s mission statement.